Here’s one of the greatest grouse guns of all time – and if its all good, it’s heck of deal. This Browning Superlight is lightweight and it has modern dimensions and 2 3/4″ chambers, and one of the most reliable single triggers ever made. 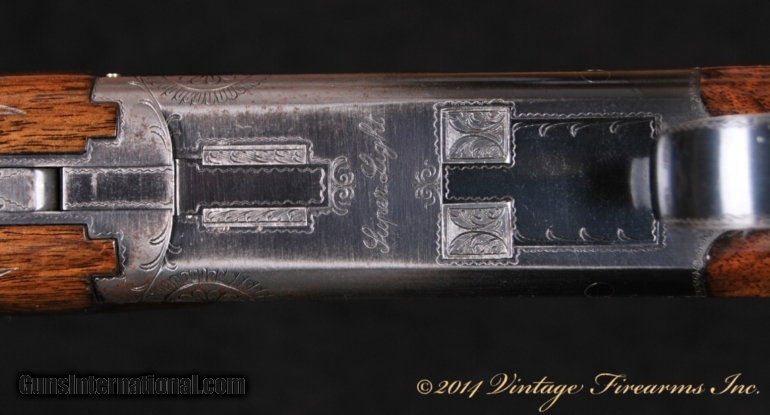 The Browning Superposed has been the most notable over/under commercially produced in the world. From its arduous beginning in the late 1920’s, to its introduction in the U.S. in 1931, the Superposed has been popular amongst shooters and collectors alike. Adorned with various levels of engraving and decoration, this creation of genius gun designer John Browning was finally discontinued from full production in 1977 with the beginning of the “Presentation Series”. In 1969 Browning introduced the Superposed “SUPERLIGHT” in the 20ga. and finally was born a true upland bird gun. A typical Browning Lightning hunting model weighs about 6 1/2lbs. in 20ga. At 5lbs. 11oz. and balanced dead on the hinge pin, this 20 bore Superlight is over 3/4lbs. lighter! This is a truly dynamic upland bird gun, with its straight hand stock, rounded frame, and schnabel forend that can be carried all day without fatigue. This gun, sn2736V72 has indeed been carried, as it has honest wear throughout. Built in 1972, it is one of only 746 total 20ga. Superlight guns made between 1969 and 1977. Highly desired by upland hunters that are in the know, these guns usually trade in the mid $4000 or more when in high condition. With about 92% factory blue on the receiver and barrels and 98% factory finish on the stocks, the gun is still ready for the field as she sits. Priced to sell to a guy that hunts more than he collects, this is an opportunity to own a great Browning.